Nano 1212 CNC Cutting Machine manufacturing system was in place with highly efficient assembly line which allows a mass production. In consequence, we have reduced the production cost substantially. Yet, increase of production volume lead an increase of purchase bargaining power. The saving in purchasing in bulk becomes more significant accordingly to the drastic increase of machine that we produce. While research and designing stage, one of the crucial factors is on delivery cost. Nano Series was designed as a ‘folderable’ machine which reduces the space of shipping case. This design solves loads of shipping problem and yet gaining in the drastic reduction of shipping expenses. 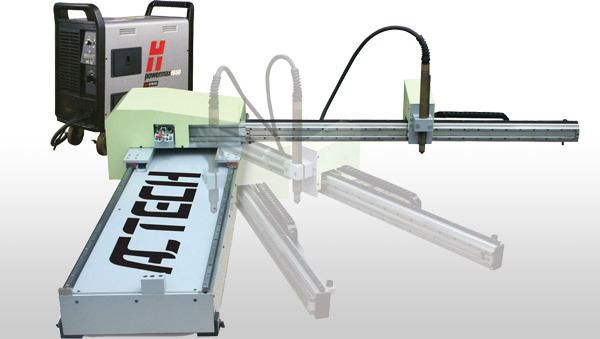 All these cost savings ultimately brought NANO 1212 CNC Machine’s price to unbelievable level. • Extruded aluminum profile as gantry structures. Effective cutting width 1200mm / 48"
Effective cutting length 1200mm / 48"
Parameters Programmable kref width, plunge rate, feedrate, pierce delay, cut direction, lead-in and lead-out size.